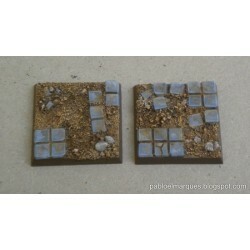 Set of bases that represent a ruined tiled floor. 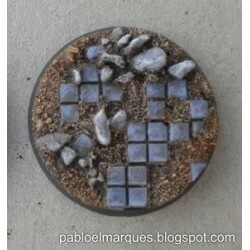 These bases were designed for my Mordheim miniatures. The realistic design makes them suitable for fantastic and historical wargames. 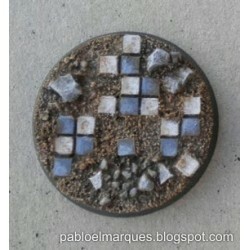 Models 20mm square, 25mm and 40mm. Round 25mm and 40mm models. These pieces of resin are supplied unpainted. Ruined tiled floor There are 7 products. 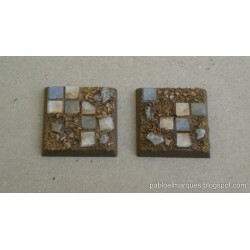 Set of 10 resin bases, design 'Ruined Tiled Floor' 20mm square. 7 different models: (7 + 3 repeated models are included) (7 models who appear in the photos). These parts are supplied unpainted. 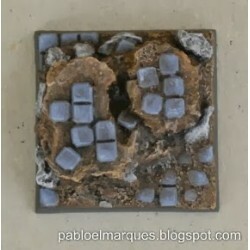 Set of 10 resin bases, design 'Ruined Tiled Floor' 25 mm square. 8 different models: (8 + 2 repeated models are included) (8 models who appear in the photos). These parts are supplied unpainted. Peana diseño 'Embaldosado en ruinas' cuadrada de 40mm, modelo 1. Estas piezas se suministran sin pintar. 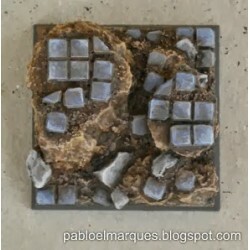 Peana diseño 'Embaldosado en ruinas' cuadrada de 40mm, modelo 2. Estas piezas se suministran sin pintar. 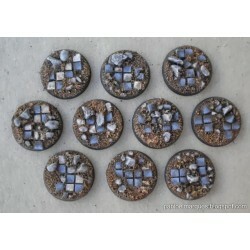 Set of 10 resin bases, design 'Ruined Tiled Floor' 20mm round. 10 different models: (models who appear in the photos). These parts are supplied unpainted. Peana diseño 'Embaldosado en ruinas' redonda de 40mm, modelo 1. Estas piezas se suministran sin pintar. Peana diseño 'Embaldosado en ruinas' redonda de 40mm, modelo 2. Estas piezas se suministran sin pintar.